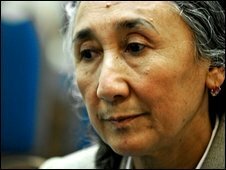 Rebiya Kadeer is the head of the World Uighur Congress, which represents the Uighur community in exile. She lives in the US, but is often blamed by the Beijing government for being behind protests and riots inside China's restive Xinjiang region. She has rebuffed accusations that she has stirred up violence in the regional capital, Urumqi, in July 2009. 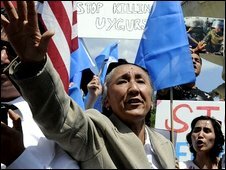 "I am fighting for the rights, for the self-determination for Uighurs," she said in a recent BBC interview. She also denies Chinese accusations that she has links to the East Turkistan Islamic Movement, a separatist group the US put on its terrorist blacklist. Released from prison in 2005 after spending six years in a Chinese jail, Mrs Kadeer fled to the suburbs of the US state of Virginia. From there she presides over both the World Uighur Congress and the Uighur American Association. She was nominated for the Nobel Peace Prize in 2006. She was a successful businesswoman and philanthropist in China until her arrest in 1999 for allegedly endangering national security. At the time the authorities said her crime was to send local newspaper reports about the activities of Xinjiang's Uighurs to her US-based husband, even though these were freely available. It was a sharp reversal in fortunes for someone whose local achievements the Communist government had until then trumpeted. Mrs Kadeer, twice-married and the mother of at least 11 children, grew up in poverty but at the time of her release was known locally as "the millionairess". Human Rights Watch researcher Mickey Spiegel, who has met Mrs Kadeer's family several times, describes her as "a very enterprising woman, who was able to bring herself up, in a sense, by her bootstraps". After working as a laundress, Mrs Kadeer founded and directed a large trading company in Xinjiang, and used her wealth to provide fellow Uighurs with employment and training. Partly as a result, she was appointed to China's national advisory group, the Chinese People's Political Consultative Conference (CPPCC), and sent as one of the country's delegates to the United Nations World Conference on Women in 1995. But her treatment by the authorities changed, rights organisations say, when her Uighur husband and former political prisoner Sidik Rouzi fled China for the US in 1996. He had previously been imprisoned for campaigning against China's treatment of the ethnic minority, which make up slightly more than half the population of Xinjiang. Mrs Kadeer's passport was seized, she was harassed by police and, in 1998, barred from reappointment to the CPPCC. Before her arrest, Mrs Kadeer was running the 1,000 Families Mothers' Project, which helped Uighur women start businesses. She was detained in August 1999, on her way to meet a visiting delegation from the United States Congressional Research Service to complain about political prisoners in Xinjiang. She was convicted of endangering state security by the Urumqi Intermediate People's Court on 10 March, 2000. She left China in March 2005, but some of her family members are still there. She says her family is frequently singled out for persecution, and two sons are currently in jail.